Yes of course, thank you. If you need the files or pics in an other format let me know. 1. The I2C connection to the compass module is very sensitive for electrical noise. A good (very good) cable is needed when the connection is longer then a few centimeters. 2. The cmps-11 is sensitive for electrical fields (e.g. from the alternator) and also for magnetic noise. 3. I didn´t get a stable data flow via the RS232. I think this is cause the critical connection via the I2C. When I using the USB-Connection to my rasbberry it works good and stable. After a month of trial and error I have now a good working heading sensor. I found a Position for the sensor where it´s not disturbed ba electric noise or so. After found this I have good working Radar overlay and also Marpa works fine. But now I found out, that there is a new module, the CMPS-12. I ordered one and here at home it´s very much better than the cmps-11. 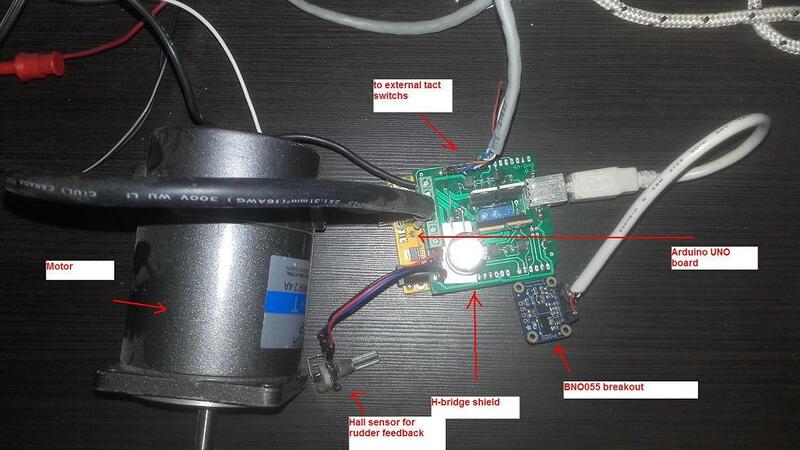 It´s autocalibrating so you can put a pice of metal nearby the sensor and this have no effect of the sensors output. I try a Samsung Tab with a magnetic closing case wich brings the cmps-11 totally out of direction, nothing happens, the cmps-12 still shows right heading. Tilting and rotating have not such effects of the moduls output than on the cmps-11. So I decide to Change the module in the boat, changing the cmps-11 to a cmps-12. It´s possible to use the cmps-11 sketch but I write a new one with a possibility to correct the compass with a devitation Chart and it´s possible to Output a diagnostic Modus on the serial Monitor. I changed the circuit, I use now a ready-build RS485 module. I use an arduino prototype shield so it looks more professional. Pics, sketch and circuit as attachment. yes the mpu9255 is less expensive but the great advantage of the BNO055 witch is used in the CMPS-12 is the autocalibration routine. This means that the sensor is calibrated at every clock step of the Prozessor and is so able to recognize changing electromagnetic fields in his enviroment and change his calibration so that the electromagnetic noise is elleminated. With a sensor witch is calibrated at start up for one time the sensor is more sensitive for electromagnetic noise. As I wrote before you can put a magnet directly nearby the sensor and the sensor is unimpressed by this. When you look at the data sheets there are no big differents in the values for the sensors itselfs. Using a cmps-12 is just one possibility for getting an accurate heading sensor (and it´s also possible to use the gyro and accelerometer values for autopilot applications). I didn´t say that´s the only one. It based on the solution of Hakan with the CMPS-10 witch is out of line and it´s more information for the users who will follow Hakans well described and documented guide for building an arduino based heading senor. pypilot has autocalibration routines that can work with any sensor. Thanks for the informative info. I think it will be my winter chore updating my now old circuit to get rid of the programed deviation table. you might still need it even with a "calibrated" compass if you want absolute accuracy better than 3-4 degrees. Not sure I have said this but some smartphones have a heading sensor. So you can tap into this one via BT or wifi. The phone would have to be fixed to the boat and not be able to move. This is not really what most people expect of their phone, but maybe if you have an extra or don't mine, ok. You get a heading sensor that consumes 100x more more power. wifi and bt links are unreliable and can lag as well. Lag is bad. For radar overlay it will give a picture jumping around more. For autopilot, it will consume more power and not steer as well. All because there is more time in getting the sensor reading. IMHO bluetooth GPS connections to Cellphone GPS are only useful in an emergency. The cell battery is taxed and run down very fast and the cellphone needs to be plugged in continuously. Same probably applies to heading sensor. but the great advantage of the BNO055 witch is used in the CMPS-12 is the autocalibration routine. Te autocaliobration routine of th BNO055 was a nigthmare to me; there is very little info about the fusion algorithm inside it. In fusion mode I couldn't make it work properly, the heading switched one side to the other about 10 degrees every 5 or 10 minutes. But, the sensor itself is great, I used the magnetometer and accelerometer for making a compensated compass for steering my AP. It's not tivial, you must to calibrate the magnetmoeter looking for the max and min values for each axis and mapping to 1,-1 ; doing the same for the accelerometer, filter the signals, and then apply the compensated compass algorithm. That way I have a good reading of heading, very close to the value of the old good compass. Not sure if this is inexpensive, but If you like electronics and programming is a nice project to do. If you need something quick, may be an old android phone + [app I don't know if already exist] could help. 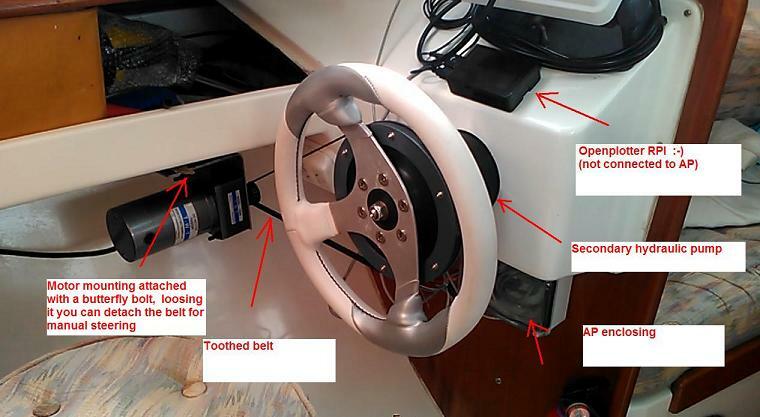 pypilot has autocalibration specifically designed for boats. Turn the boat more than 180 degrees and it autocalibrates. Any time you do this, the calibration updates. The code is free software, so all the information on how it works is there. Sure. this sensor is supported by pypilot, it just uses the raw sensor values and runs it's own filter. There is not much point when much cheaper sensors exist. This is not a good way to calibrate. You instead should estimate the correct bias and scale factor from least squares fitting of samples. Looking for max values is error-prone because on a circle the max value is in the area where the slope is also zero making values near this maximum over a large area. the signals, and then apply the compensated compass algorithm. That way I have a good reading of heading, very close to the value of the old good compass. What kind of autopilot? More information? What is the typical absolute accuracy of the heading from PyPilot ? Is a deviation table created ? I made this a couple of years ago, only magnetic; NMEA steering still pending.